The Walpoles01553 763044work VillageSituated around 9 miles west of King’s Lynn, The Walpoles comprise two villages, Walpole St Peter and Walpole St. Andrew, as well as the hamlet of Walpole Marsh to the north-west. The Walpoles have a rich history. The area is known to have been settled by the Romans, who built the massive earthen sea wall which is still called Roman Bank. Until the installation of the 1st Sutton Bridge, in 1821, Roman Bank provided the only route from north Norfolk into Lincolnshire. Some say that King John lost his treasure in Walpole, in 1216, whilst journeying from King’s Lynn to Newark. The name Walpole is said to be derived from the 2 words ‘wall’ and ‘pool’ and was adopted as the surname of a local family that moved away from the area, and in time produced the country’s 1st prime minister, Sir Robert Walpole (1676-1745). The outstanding attraction of The Walpoles, is St Peter’s Church. 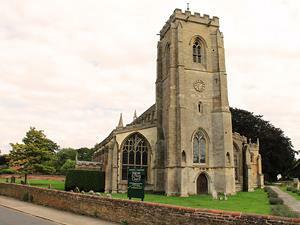 Known as the Cathedral of the Fens, it is often regarded as one of England’s finest parish churches. The oldest section of the church is its tower, which dates from the 13th century. Much of the remaining church was destroyed in a flood in 1337. By the 15th century a huge church, 160 feet long, was added. Whilst the windows are in the Perpendicular style, and whilst some benches date from the 15th century, the overall ambience is Jacobean, including a carved Poor Box dated 1639 and a huge chandelier dating from 1701. The church of Walpole St Andrew, which lies just a few fields away, is no longer user for regular worship, and is looked after by the Churches Conservation Trust. It features an anchorite’s cell built into the buttress and s sturdy, brick-built tower that dates back to the 15th century. Situated around 9 miles west of King’s Lynn, The Walpoles comprise two villages, Walpole St Peter and Walpole St. Andrew, as well as the hamlet of Walpole Marsh to the north-west. The Village is home to Walpole Water Gardens which has a tearoom and is licensed.